Mode of occurrence: Fragment of a large nodule. Cortex: Some parts 1.5 cm thick, white, rough and smooth patches, transition sharp but irregular. Colour: Pale yellowish brown mottled with brownish yellow (10YR 6/3 to 6/6). 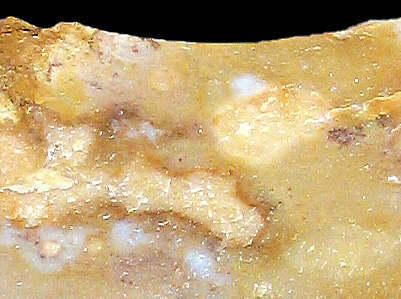 Appearance: Lacks homogeneity (patches of unreplaced matrix, very large clasts), dull and opaque, dry, medium-grained. Structure: Convoluted bioturbation figures, patches of chalcedony. Texture: Wackestone to packstone depending on the patches. Grains: 30 to 40 %, very rounded and irregularly shaped, pale or stained yellow and orange by iron oxides, quite well sorted (100 to 150 µ). Grain composition: Numerous sponge spicules, acritarchs, small benthic and planktonic (biserial and globose) foraminifera, sea urchin radioles, echinoderms. Geographical description: The material was collected along the GR 59 long-distance footpath near the castle of Chenavel, which lies between the hamlet of Chenavel and the N 84 road, overlooking the river Ain, between Poncin and Pont-d'Ain. Co-ordinate precision: The French coordinates of the national Lambert-grid were read from an detailed topographical map. We calculated the geographical coordinates by transforming those values on the WGS84 ellipsoid. Geology: The flint here occurs in clays-with-flints of various origins (Early and Late Cretacous), although the silex is clearly of Late Cretaceous (Senonian) age. 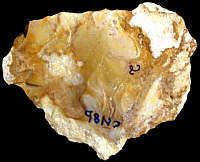 Other types of flint: Two other Senonian flints might be found here: CN1a and CN8a.